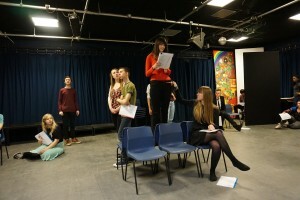 Escape:CYT is a youth theatre where young people are writers and theatre makers in their own right. 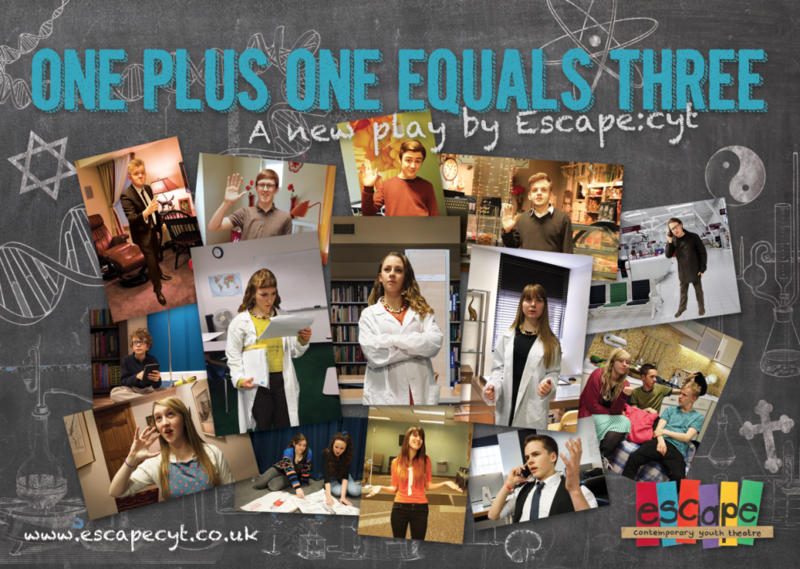 Their new show One Plus One Equals Three opens on Thursday and group director Simon Brewis tells us how they made it. The group I work with at Escape:CYT come every week because they want to act but over the past few years I have introduced the idea that they should perform work which they own themselves as artists. My role is complicated because my guidance and direction is necessary to set the structures where a group of young people have the power to make the work. It is a balancing act which we have been learning more about each time we make something together. The process of writing and then staging our new show began last summer. I was on an aeroplane flying to Sweden to attend my brother and sister-in-law’s wedding anniversary party. As I stared out of the window overlooking the wing, I started thinking about all the different voices I heard on the aeroplane, why they might be going somewhere, why I was travelling. What brings us to journey across oceans and visit new cultures? When I returned we started to brainstorm around the idea of ‘Global Culture’. We created a number of unrelated scenes which we performed at a scratch performance at the Carriageworks Theatre alongside the Carriageworks Young Theatre Makers – another youth company which also devises their own work. By bouncing the idea back and forth between us we found a number of compelling characters and situations that felt like they crossed cultural barriers: a man who transfers his frustration in his own life onto an innocent woman at an airport; a young woman who wrestles with maths and science, being universal languages. Bigotry, art and religion were themes that resonated with the young people. Also I made sure we held onto love because it was two people who were in love that caused me to be on the flight to Sweden. Here is where the process gets messy but I think that is the same for any theatre company that makes original work. Understanding the starting point is easy and you can see the end point but how things go from the start to the end is the confusing and the most fun part. I set a number of characters and a broad possible story arc from the scenes that the company had created. I then asked them to devise scenes with x character where y theme was explored. However, what they made from there was up to them. We would film the scenes and then the cast typed them up and edited them. Then I edited them again to fit the overarching story. Sometimes things wouldn’t fit and hard decisions had to be made. There was a wonderful section about the multiple words for genitalia in the fictional Dothraki language from Game of Thrones that never made it into the script which I still feel a bit sad about. What we came out with in the end looked nothing like what I had originally imagined, and I think that is only right. I suspect it is different from what any other one company member imagined it to be as well. It is a very organic process but that is kind of the point. 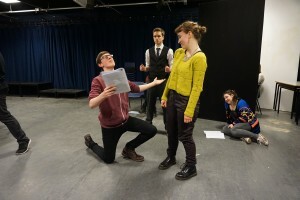 The final performance follows a character, Una, through three different time periods in her life on her journey to becoming a Particle Physicist. In each time she is involved in a different relationship, and through all three time periods she is on a journey with her faith perspective. In the end we moved a long way from our starting point but I am pleased that when I look I can see the journey of the ideas. 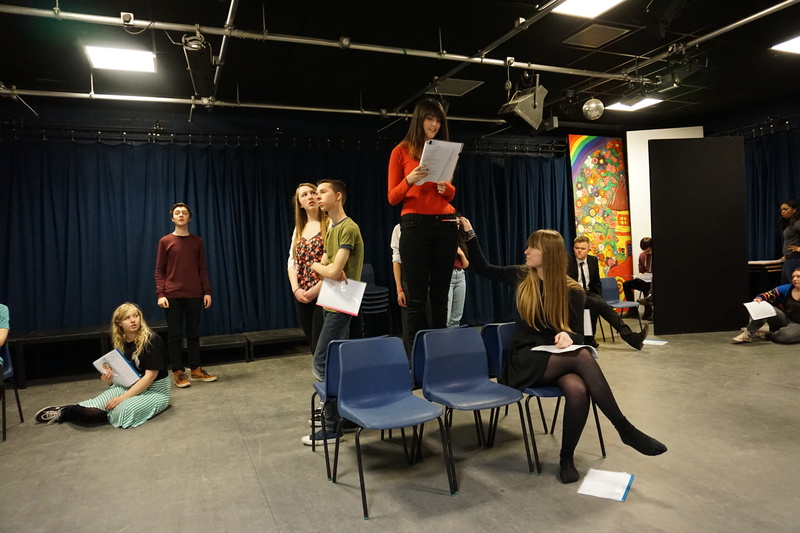 I am also pleased because I think this is the most ‘collaboratively written by young people’ play that we have produced so far. Newly written by Escape:CYT, this comic, visual and character driven performance tells the story of a young woman between the ages of 17 – 29 as she explores science, faith and love. Year 2000 – Una is 17 and loves to understand how the world works. She has a boyfriend who is Jewish, she doesn’t share his faith but she thinks it is interesting… her Dad finds it difficult. Year 2004 – Una has followed her dream and is studying science at university. She meets an artist and visits new places. Science and art might not be as separate as they first seem. Year 2012 – Dr. Una is offered the opportunity of a lifetime but every action has a reaction and what will Karma bring? Previous story Subversive Peacemakers. Book Launch, 26 March.